89-year-old Hermina Hirsch fulfills lifelong dream, sings national anthem at Detroit Tigers-Tampa Bay Rays game. (JTA) -- A Holocaust survivor, fulfilling a lifelong dream, sang the national anthem at a Major League Baseball game. Hermina Hirsch, 89, performed "The Star-Spangled Banner" on Saturday at Comerica Park in Detroit prior to the Tigers' game against the Tampa Bay Rays. Hirsch in an interview last month with the Detroit television station WWJ called on the ballclub to allow her to sing and said she would not be nervous singing in front of thousands of baseball fans. 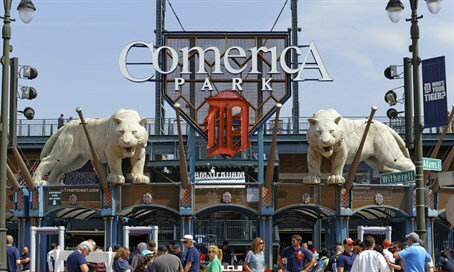 She reportedly has been a Tigers' fan since moving to Detroit with her husband in 1953. The couple immediately began attending baseball games.